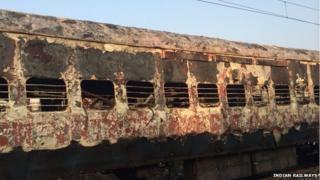 At least nine people have died after a fire broke out on a train in India, officials say. The blaze engulfed at least three coaches of the Dehradun Express as it travelled through the western state of Maharashtra. It broke out in a second-class coach of the train at about 02:30 local time (21:00 GMT) and soon spread to two other connected coaches. The train was travelling from Mumbai to the northern city of Dehradun when it caught fire in the Dahanu area of Maharashtra's Thane district. "The fire was reported by an official at a railway station and subsequently the train was stopped and most of the passengers were evacuated," Sharat Chandrayan, Western Railways spokesperson, told the CNN-IBN news channel. "We cannot speculate about what caused the fire. An eyewitness told us that the fire started from a coach. But those details are yet to be verified and inquired," he said. Traffic had been restored on the track, he said, and those evacuated had continued with their journey in the remaining coaches of the train. At least 26 people, including two children, died after a fire broke out on a train travelling through southern Andhra Pradesh state in December. And in July 2012, 47 people were killed in a fire on a passenger train, also in Andhra Pradesh. Both blazes were attributed to an electrical short circuit.